One of the troubles of supermarket shopping is that most veg comes pre-packed. And when you're the only person in the house who eats vegetables, you can end up eating the same thing day after day after day. Or making a lot of soup. At the moment, I have a fridge full of leeks. I only wanted one for soup last week, but loose ones were more expensive than the bargain pack for 50p. So of course, I figured that I'd buy the bargain pack and do lots of leek-y things. Fast forward a week and all but one of those leeks is still in my fridge. I am rubbish at cooking dinner for myself some nights because by the time I've cooked for Miss A and the husband, I really can't be bothered to cook for me. And with my tastebuds having been obliterated by a cold this week, there really wasn't much chance of them getting used. I know I could go to my lovely local farm shop, but when you're a full time working mum, the last thing you want is to schlep around three different food shops with a fractious toddler every weekend. This is sadly why supermarkets do so well and so much food gets wasted. Anyhow, after my day out was sadly cancelled, I found myself looking for leek and potato recipes and happened across one for the latkes. 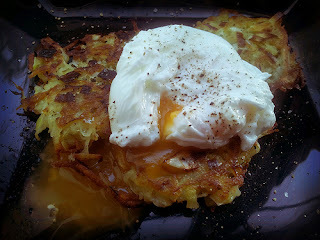 Latkes are a Jewish dish, commonly served over Hannukah - woohoo, I'm doing seasonal food! - and are usually potato based but have lots of other additions. In essence, they're similar to a rosti - something I've never cooked myself - but they seem that way. And I wouldn't know if the recipe I used was genuinely Jewish or not, having never eaten a latke before. Looking through the variety of recipes available on the net, there are different methods including using breadcrumbs, matzo meal or flour to bind the mix together. The recipe I chose, however just relied on the egg and starch from the potato to bind. I wasn't convinced by this method and once I'd made it, despite squeezing as much liquid as I could from the potatoes, they were still really wet. I squeezed each pattie before I cooked it but I really had to be careful when flipping them to stop them falling apart. I then added some flour to the remaining mix which made them a bit more like a traditional potato cake, but they lost their delicate leek-y flavour. Topped with a poached egg, they made a great light lunch. I think if I made them again, I'd wrap the grated potato in some kitchen towel after the initial squeeze-fest to remove any residual liquid.